Do you remember show and tell? In nursery school, I had to bring in an unusual item and explain it to my classmates. Unlike my friends, I didn’t settle for an ordinary toy or household object. Instead I brought my sister. The great advantage was that she was able to talk for herself. 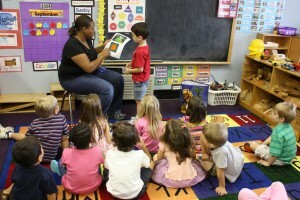 Over the years, I’ve found old-fashioned show and tell to be a useful teaching technique because it illustrates the point better than describing it can ever do. Here are three blogging elements where show and tell can help you learn and improve your craft. 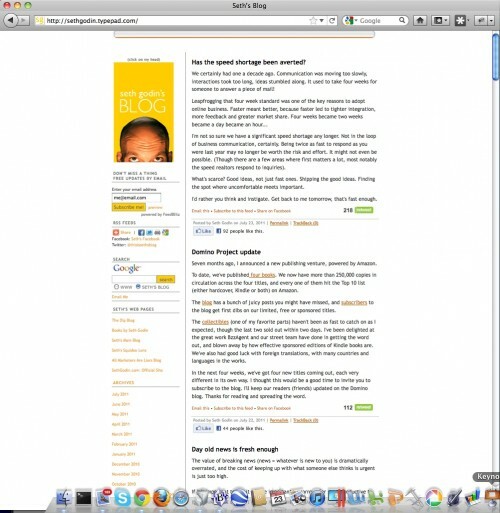 Blog name – Would a blog by any other name be as interesting? Like parents, some bloggers spend hours deciding what to call their blog. Among the options are your business or personal name, category word(s) or a made up name. Using your name or your company’s name supports your branding efforts. The problem as Chris Brogan has pointed out is that this strength can be a drawback when you want to get others to help you handle the content creation duties. (Fortunately, Chris is a prolific writer.) Another option is using basic words that identify your blog’s category or niche. This supports your search optimization if you own a URL like this. But bear in mind that if you use multiple words, readers may not know whether to smush them together or include dashes or underscores. Many of the blogs in this category are part of commerce sites since the URLs tend to be expensive and difficult to get. 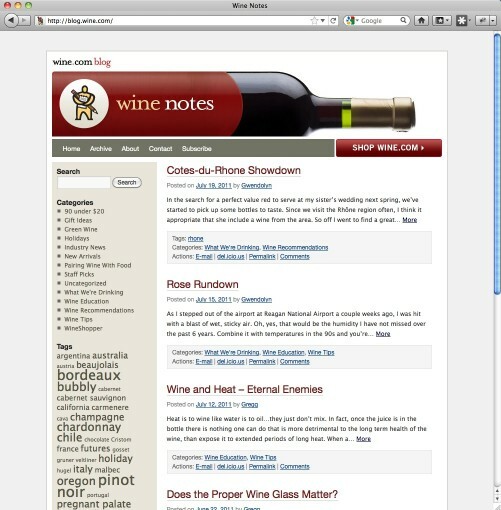 Therefore, they use a sub-domain like Wine.com’s blog ( http://blog.wine.com ). 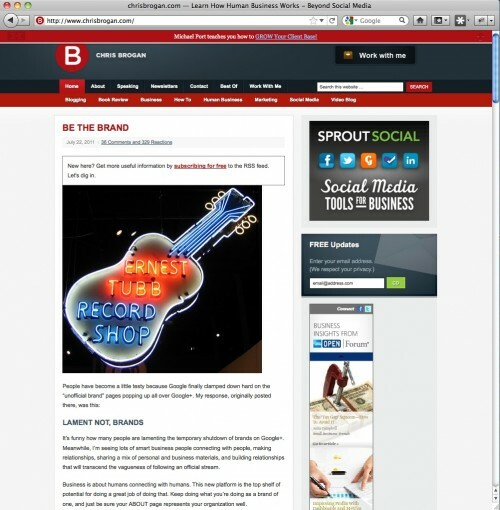 Blog design – Does your blog stand out from the crowd graphically or is it an off-the-shelf cookie cutter? While design elements aren’t required, they go along way to making your blog more interesting and keeping visitors engaged. 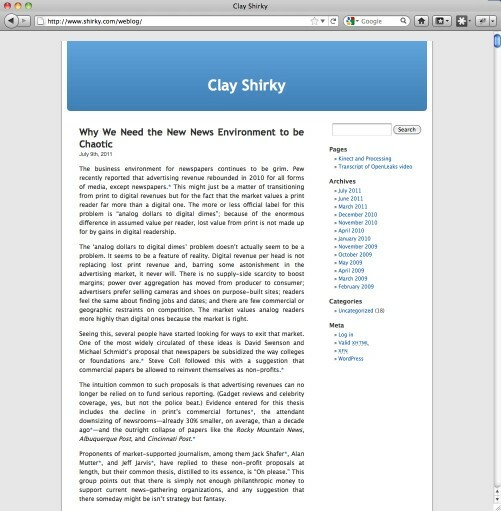 You can go for the stripped down version where the focus in on your words like Clay Shirkey whose blog hasn’t changed from its humble WordPress beginnings: Alternatively, you can make minor changes to a theme such as Jay Baer’s Convince and Convert blog does. 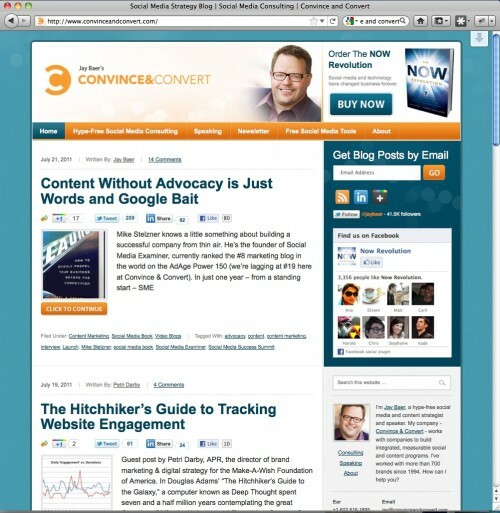 Convince and Convert is branded and integrates Jay’s photograph. This gives readers the feeling that Jay is talking to them which is important for a blog. 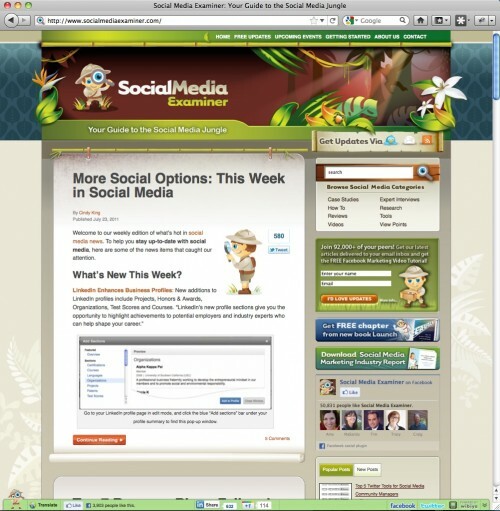 Social Media Examiner uses extensive design that flows through every element of the blog. Each of these three options makes a branding statement. Often the tradeoff is how much money you’re willing to invest in graphics and related technology support to implement them. By examining each of these show and tell examples, you can see how each blog has taken it’s own unique path. Despite these differences, each blog is successful because, like my sister, they use their own words. Are there any other aspects of blogging for which you’d like to see some show and tell? This post is dedicated to my sister and the memories of show and tell. 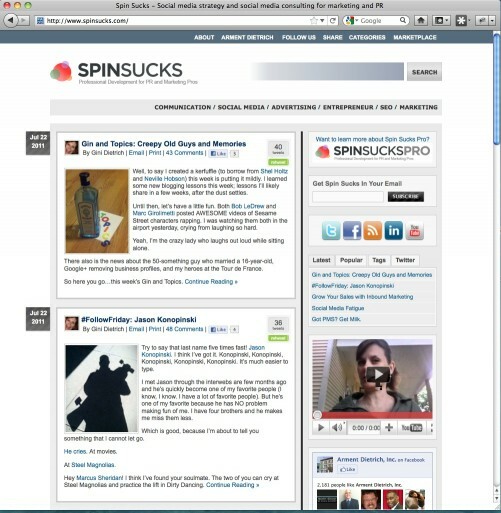 Here are some related blogging articles. 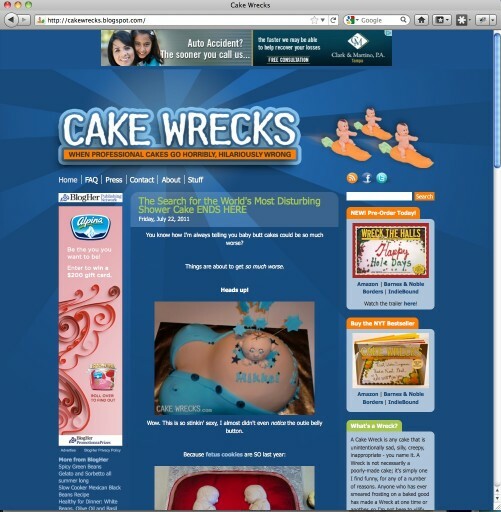 Tags blog design, blog name, Cake Wrecks, Chris Brogan, Clay SHirky, Jay Baer, Mack Collier, Seth Godin, Social Media Examiner. Bookmark the permalink. Just wanted to tell you that I really do enjoy your posts and get a lot out of them-so thanks.